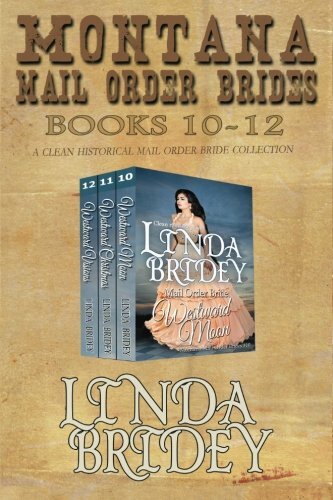 Now available as a print book, books 10 - 12 in the Montana Mail Order Bride - Westward series ** A clean historical cowboy romance boxed set ** Westward Moon: Sparrow, a Lakota woman, is married to an abusive man she hates. Her father, the chief of her tribe, has denied the divorce she is entitled to by Lakota law and she lives in misery until with the help of a friend, is able to contact Jack Samuels, the handsome deputy she fell in love with years ago. Jack Samuels, heartbroken when Sparrow&#x2019;s tribe left for good, has never forgotten his Lakota maiden. When he receives a mysterious letter from Nebraska, he quickly realizes that Sparrow is reaching out for help. He jumps at the chance to be with Sparrow again and is soon on his way to rescue her. Getting Sparrow back home to Dawson is the easy part. While danger lurks everywhere, the biggest threat comes in the form of secrets and lies. Can their love survive or is the handsome deputy and the Lakota maiden&#x2019;s love to be forever denied? Westward Christmas: Sasha McCall and Dr. Ben Walker shared an instant connection when she visited Dawson, Montana before. Sasha moves to Dawson and a powerful romance develops. The Christmas season approaches but events test their love turning things dark. Can they find joy and light again? Westward Visions: Reckless Wolf on the Hill is a Lakota brave who lives near Dawson, Montana. He&#x2019;s a fun-loving, fierce warrior who is in search of a bride. However, there are no women in their tribe who catches his eye, especially because most of them are related to him. Courting a woman from Dawson is out of the question because no woman he knows there would ever live in an Indian village. After voicing his frustrations to his friend Abby Bradbury, she convinces him to search for a bride with a tribe she was friends with in Wabasha, Minnesota. Reckless is always willing to do the unexpected or come up with creative ways to solve problems and decides to give it a chance. Whispering Brook is a Lakota maiden who&#x2019;s romantic future looks bleak due to a familial tragedy. Considered bad luck by most of the tribe now, none of the younger braves wish to court Brook. When Abby first contacts her family about this Montana brave who is looking for a bride, Brook is filled with dread at the thought of marrying someone she has never met. Her parents accept this Reckless&#x2019; proposal, however, because he offers a very good bride price. Though it is unusual, her parents agree to let Brook exchange letters with Reckless if it will ease their beloved daughter&#x2019;s mind about the man. By the time her family makes the trip to Dawson, Brook is smitten with Reckless and even more so upon meeting him. He&#x2019;s handsome, charismatic, and lives up to his name. Reckless finds Brook beautiful, sweet, and spirited; just what he&#x2019;s been looking for in a woman. Their romance blossoms and they are soon married. The young couple is happier than they ever expected until a devastating tragedy befalls the tribe and creates tension and heartache for all&#x2014;including them. Reckless and Brook face an uncertain future when pride and anger threatens to divide them for good. Can they get past these obstacles to ensure their visions of a life together?